Pop. 718. 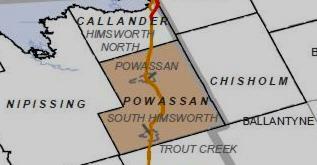 In Nipissing T., Parry Sound Dist., on South R., 6 km S of L. Nipissing and Hwys 534 & 654, 30 km S of North Bay. Pop. 1,093. In South Himsworth T., Parry Sound Dist., on Genesee Cr. (a branch ofthe South R.), Hwy 11 and C. Rd. 534, 30 km. S of North Bay. We hold an annual fair every Labour Day Weekend. Pop. 60. In Pringle and Gurd Ts., Dist. of Parry Sound on the Commanda R. and Hwy 522, 40 km. S of North Bay. 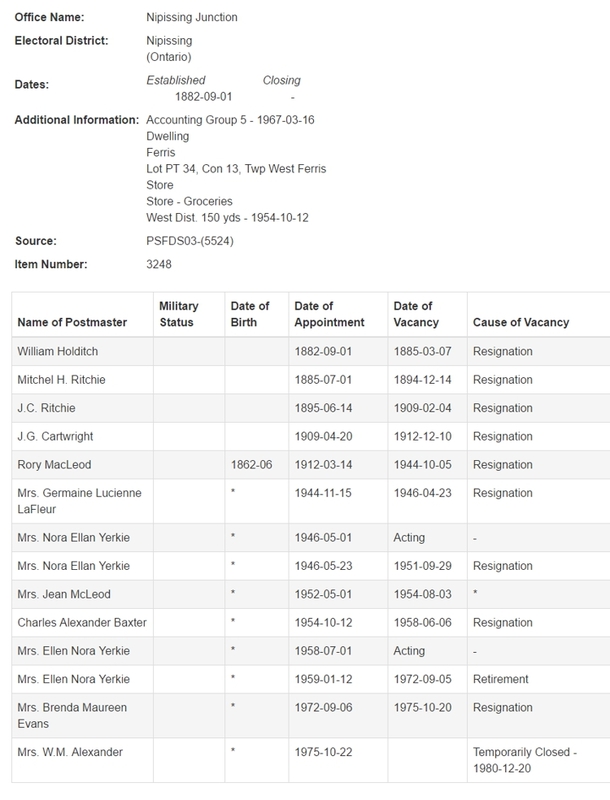 The community, surveyed in 1882, was named for a First Nations Peoples chief. Pop. 660. 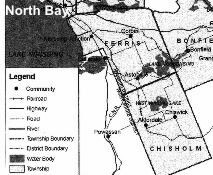 In South Himsworth T., Parry Sound Dist., on Hwy 11 & 522, 40 km S of North Bay. Pop. 1,158. In North Himsworth T., Parry Sound Dist., on the E end ofL. 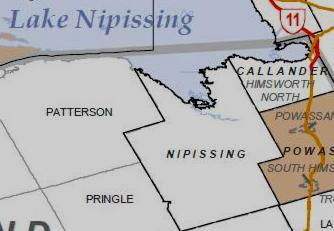 Nipissing, 11 km SE of North Bay. Pop. 15. In East Ferris T., Nipissing Dist. on the N shore of L. Nosbonsing, 22 km. SE of North Bay. Pop. 179. In Parry Sound Dist. on Commanda L. and Hwy 522, 20 km SW of Trout Creek which is 42 km. S of North Bay. In 1875 the community was named after Ojibwa chief Joseph Restoule.